Tenerife history Los Gigantes started off as a fishing village. Construction of the Marina of Los Gigantes in 1950 which is renown today for its organized whale watching and deep sea fishing trips. 1950 Capdeville discovers the region for tourism . The Frenchman Capdeville is impressed by the cliffs and the protected bay. He and two friends set up a firm to attract tourists. He goes the extra mile by monitoring sun hours, wind and humidity of the region for two years. Following this, the good weather becomes part of the tourist promotion motto that is also available by brochures in different languages. Needless to say, the political town fathers of Santiago del Teide support with infrastructure. King Mencey Pelinor of Daute now Los Gigantes. Of course, Los Gigantes has much in common with the island's olden days before Tenerife's conquest at the end of the fifteenth century. The region of its aborigine owners was then known as 'Daute'. Their main occupation by the awesome Los Gigantes cliffs and neigbouring coast was fishing. The pastures for their black pigs and mountain goats were inland. More about the Guanche culture here. 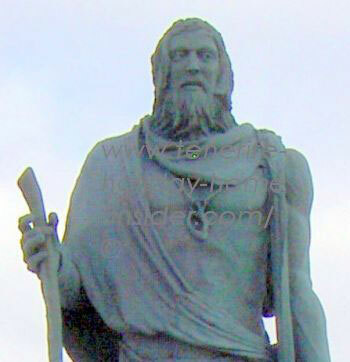 The Guanche king of Daute was Mencey Pelinor. There is also a statue by his son who was baptized Don Alonzó Diaz Cherfe. It's on the main church square of the Santiago del Teide capital. How did the settlers after the conquest make a living? Fishing was the main occupation by those who didn't have to tend fields for few aristocrats who owned all the land. Commerce with neighboring islands like nearby La Gomera was all about sugar cane, wine and honey. It's said that the Teno coast had its nooks and hidden corners which helped to smuggle goods in and out of Los Gigantes. Make out such an ancient spot portrayed beside which obviously has seen its traffic of way back. Tenerife history rumors have it that pirates were taking their boats to the remote bay of Masca and were hiding out in its mountain village which had no public road in those days. However, Masca was tempting to reach by sea from Los Gigantes. Faro Punta de Teno a Teno lighthouse by Los Gigantes. Interesting in this context is the lighthouse Faro Punta de Teno in its neighborhood. The one depicted beside was constructed around 2008. It fulfills modern expectations. A first and rather primitive lighthouse was built at the end of the 19th century. It took almost ten years to be ready to be used in 1897. This lighthouse by one of most virgin country sides doesn’t only invite to excursions but, also merits a mark in Tenerife history. 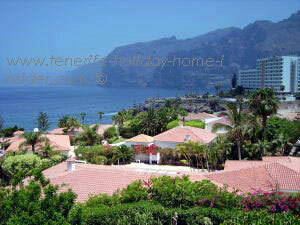 Tenerife holiday homes Puerto de Santiago Los Gigantes. The craft revived in 1986 by Doña Quiteria Amaro. Tenerife history los Gigantes is also proud to count carnival as one of its mile stones. 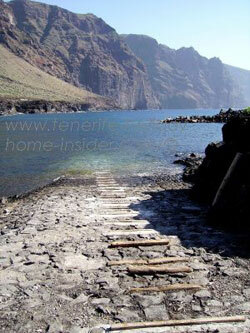 What about awesome Los Gigantes, hotels and more? Want to learn more about Los Gigantes the Tenerife town of awesome cliffs, such as where to take your dog to the sea, best spots for flyfishing, about whale watching and where to sleep the night ?